I came across this recipe the other day and have really been wanting to try it. I feel like I’ve been making the same 5-10 meals lately…mostly because that’s what we love (and so do the kids), but I also love making new things and trying new recipes. This recipe is so good and super easy to make. It originally calls for a crockpot but I don’t always like doing that because it requires too much planning early in the day and let’s just get real…sometimes (with 2 kids at home) I’m just too busy for that. Other times, when I am more prepared, I love my crockpot (and even better, my new instant pot). I was able to throw this together in about 35-ish minutes, so that made me pretty happy…and my 2 yr old ate 3 servings! #winning! 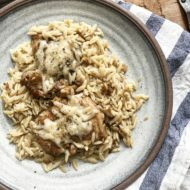 4 chicken breasts (or 5-6 chicken thighs) - I personally like thighs with this recipe. In a large nonstick skillet, over medium-high heat, heat the oil and then sear both sides of the chicken for about 2 minutes (on each side). Remove chicken when done and save the broth. In another nonstick skillet, sauté the chopped onions in a little olive oil over medium heat until they become translucent. Add garlic and 1 cup uncooked orzo to the onions. Add salt and pepper (to taste), if needed. Once the orzo is done, remove from heat, add the chicken to the orzo, and top each piece with freshly shredded parmesan. Cover the pan just to allow the parmesan to melt. Garnish with fresh herbs (optional). 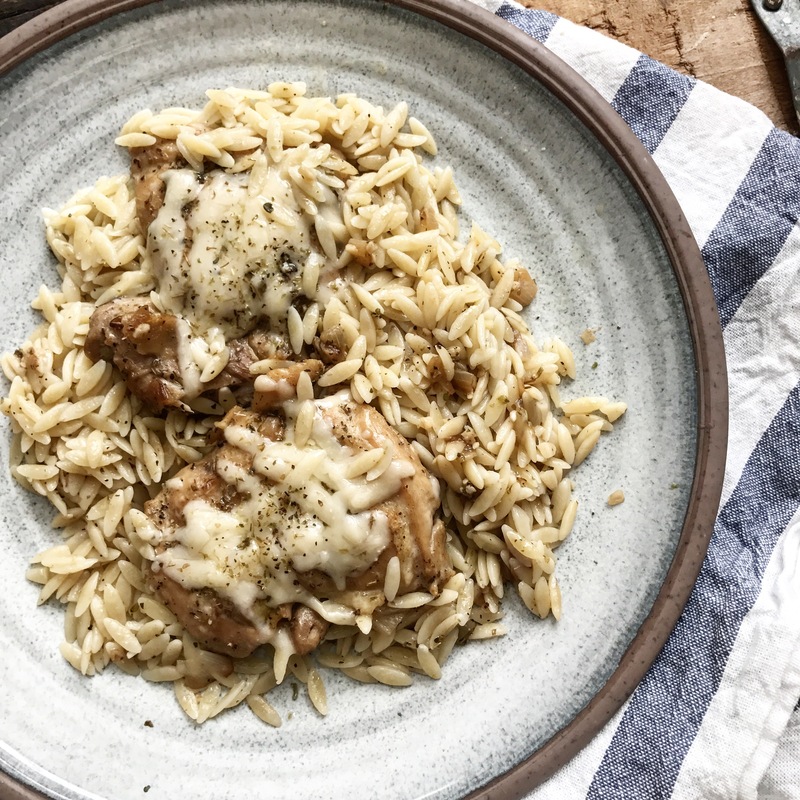 If you are in a hurry and want to cook the orzo at the same time as the chicken, just cook the orzo according to package (without using the cooked broth) and add some Italian seasoning, salt, and pepper to the orzo. **I also like to add a couple Tbsp butter to the cooked orzo for extra flavor! **The orzo tastes really good when mixed with a vegetable, like a can of green beans, sautéed zucchini, or bell peppers, etc. Just add the cooked vegetable to the orzo after the pasta is done.